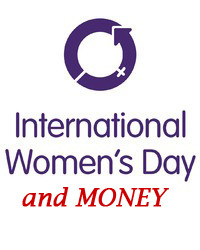 International Women's Day and Money - Women and Money Inc.
It’s interesting to see an article this week about women still being marginalized in Canadian boardrooms on the eve of the International Women’s Day March 8th celebrations that acknowledge the social, political and economic achievements made by women. Their theme this year: Inspiring Change. I think I might propose to the United Nations that their theme next year be Women and Money. It’s amazing how the truth of what is really happening to women becomes clear when we look at their role in making and managing money. A not-for-profit group, Catalyst Canada, recently published an analysis showing that women are far less likely than male co-workers to be in positions of authority. Only 12% of directors on boards of public companies were women. Overall numbers in the study indicated that women only occupied 15.9% of the top positions. It’s been my professional experience that a majority of women manage the family’s finances but are not well-recognized for taking on the responsibility. The burden to balance the books, pay creditors, save for RRSP’s, for holidays, children’s activities and everything else tends to fall on to one set of shoulders. This creates an imbalance where most women endure the lion’s share of financial stress. One of the effects of assuming an unfair share of the responsibility for the family money is this: If something should go wrong, women get criticized or blamed. This often leads to shame and a sense of failure. In so many overextended families struggling financially with debt, women become depressed and unable to defend themselves against this kind of aggression and condemnation. When women earn less (or no) money, they are automatically placed in a subordinate position. This is true in the corporate world just as it is in the home. Those who make more money believe they are superior – certainly in the area of decision-making when it comes to spending money. This is especially true in families where one spouse earns more than the other. Unfortunately, in many one income families, the spouses accept or succumb to their subordinate roles, leaving them vulnerable to countless abuses including the belief they have no power to change things. Consistent with the theme for International Women’s Day this year, let’s look at how we can change things and recognize that equality and fairness are principles that should be guiding these changes – that women who do not have a corporate job earn their equal status by being partners in matrimonial relationships – equal partners in a loving and caring home – and that raising children just may be the most important job of all. Margaret H. Johnson – President Women and Money Inc.; Solutions Credit Counselling Service Inc.